Skye Gravestones | Colin, Benjamin & Alexander Elder. Colin, Benjamin & Alexander Elder. In memory/of three brothers/COLIN ELDER/born 17th April 176, died 18th April 1851/BENJAMIN JOHN ELDER/born 12th June 1807, died 25th January 1857/ALEXANDER McDONALD ELDER/born 12th Novr 1801. died 4th August 1857. The memory of the just is blessed./Them also which sleep in Jesus/will God bring wit him. My great great uncles. 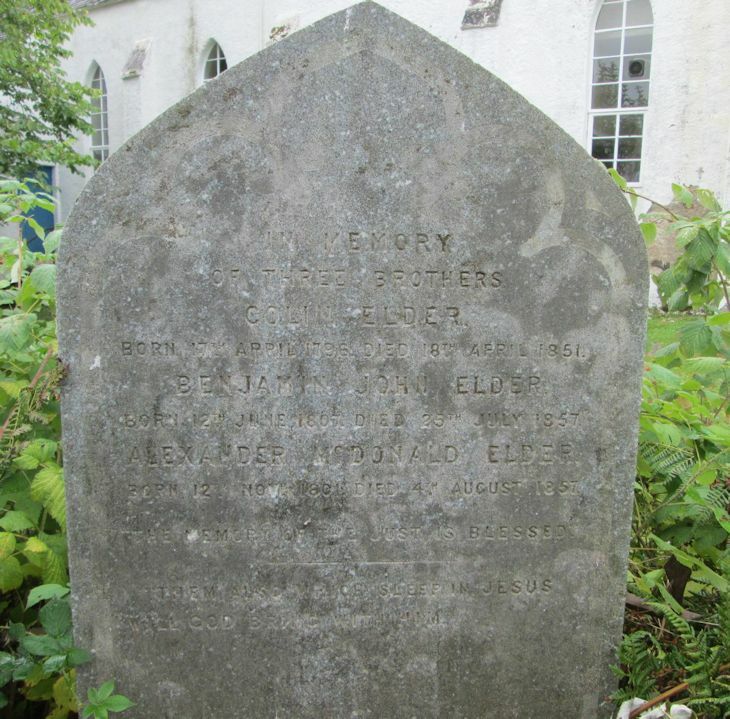 My great great Grandmother was Mary Mckinnon Elder married George Gower Bruce 1833, died Inveraray 1880. Added by MARGARET MARY ROWLING NEE BRUCE on 11 November 2015.